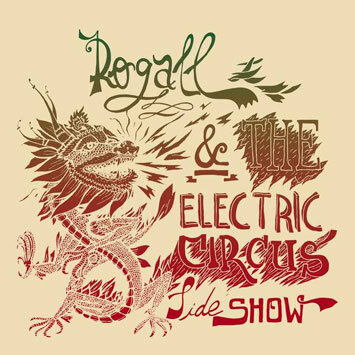 Rogall "the Electric Mysterious Wonder"
This album is full of stories. We are not just talking about the lyrics, but also about the genesis of the group and their songs. Nothing on the recording happened accidentally, but without fate it would not exist. You could say, it needed three years to produce this album, but actually it was much more time, because some of the concepts were sleeping for half a life and above all, this is not just a ordinary music group! The circumstances that led to the joining of the individual members to the group are completely diverse, but they are all linked in a special way to the "Electric Mysterious Wonder" Rogall (Nylon/ Micatone), the producer of the album. It is not a "circus sideshow" in the original meaning, but it is a presentation of the individual characters who joined forces for this project, surely some "freaks" of a different kind. The CD comes with a 20-page booklet, containing all lyrics, woodcarvings of the protagonists and an exclusive short story by Paul Waldner. Looking at DJ ROGALL's bio you come across names like Gilles Peterson, DJ Premier, Jazzanova, Tosca, Peter Kruder, Michael Reinboth, Ian Pooley, Tony Allen, Bugge Wesseltoft... so, where to starthis story? DJ ROGALL got infected by some Chicago House and Hip Hop tapes in the late 80s, early 90s but atthe same was still addicted to rare groove and jazz flavours. The style: Cobham, Galliano, KRS-Oneund Co. in the mix. Being influenced by English / Jamaican dancehall, he started regular club sessionswith live musicians in his home town of Düsseldorf in the mid 90s - before he moved to Hannover in'94. From this new home base, he became resident DJ in the Delicious Doughnuts Research club inBerlin - and being fascinated about the musical perspectives of the new capital, he again packed hisbags and moved to Berlin where you could very soon hear him regularly on Kiss FM. A year later in 1995 the ANALOGUE FREESTYLE sound system was found and got famous veryquickly - especially in Berlin and East Germany. It was a complete new way of remixing: cuttingrecords, sampling pieces of them and jam with up to 8 musicians in a club - all live! In this early Berlin year, DJ ROGALL also did a lot of Djing -he had 4 weekly residencies (!) andpresented quite a wide musical spectrum: ranging from Drum'n'Bass and Offbeat to House, Fusionand Freestyle. 1996 was the year when DJ ROGALL organizing STEPS TO THE ATOMnights a theatre venue inBerlin. 13 nights packed with cutting edge new electronic music including Pole, Kurd Duca, Kreidler, Move D., Torococo Rot. Founding the studio project ATOMHOCKEY (1997) and NoZession Production (1998), DJ ROGALLwas spinning more frequently with the also Berlin based Jazzanova crew, as well as with names likeTosca, Peter Kruder, Michael Reinboth, Ian Pooley (to name just a few). Just a year later Studio SingSing was found, now the home of his projects ATOMHOCKEY, MICATONE, NYLONandANALOGUE FREESTYLE. The new millennium started with an offer from Tony Allen, for whom he produced a track for the"Allenko Brotherhood Ensemble" project on Comet Records, and the organisation of Sonarkollektiv“Live”- Festival in 2001, including ten live acts and special guest Bugge Wesseltoft (Jazzland) -not toforget the No Zession Labelnights in Berlin and the webradio shows dj-sets.com - serving the lateststuff from Sonarkollektiv and other essential labels. The IN>SESSION Festival, organised in 2001, presented Berlin's finest in music and videoperformances: Rechenzentrum, Exponence, Jazzanova, Micatone, Static, Intega and others and wascontinued in 2002 with Lady Kier, The Bays and Jimpster.